Neri Oxman will give a keynote presentation at the Bio-inspired Materials: International School and Conference on Biological Materials Science, 18-21 March, 2014. The talk is entitled: Material Ecology: Towards Bio-inspired Digital Design and Fabrication and will be co-presented with Dr. J. Weaver, Harvard University, Cambridge (USA). 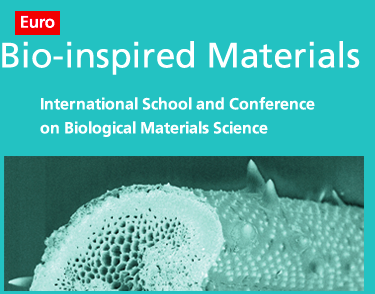 From the website: This conference aims at reiterating the success of the first "international school and conference on biological materials science (Bio-inspired Materials)" which took place in March 2012 in Potsdam. At the same place and at a similar time of the year from March 18-21 2014, we will cover recent advances in all areas of biological materials science and, in particular, in the field of bio-inspired materials. Scientists with diverse backgrounds will discuss new results about structure and function of natural materials and the ways in which those may influence the bio-inspired design of engineering materials and systems. The meeting will cover experimental characterization and theoretical modeling of structure-property relations, as well as concepts and strategies for the fabrication of bio-inspired materials with unusual combinations of properties or capabilities to self-assemble, self repair and/or evolve. Because material properties can be critical for the biological function of molecules, tissues and organs, the conference will also address materials science approaches which contribute to some areas of biology or medicine. The conference will host several invited keynote lectures, oral as well as poster contributions. The Conference will be preceded on March 17-18 by satellite meetings of two related research programs of the German Science Foundation, the DFG Programs SPP1420 (Biomimetic Materials Research: Functionality by Hierarchical Structuring of Materials) and SP1569 (Generation of multifunctional inorganic materials by molecular bionics).